The Charlie Hills-trained Battaash won twice at Sandown and once at Goodwood during the summer, but was only fourth when stepped up to the highest level in the Nunthorpe at York, getting agitated before the start. However, he burst out of the stalls this time in the hands of Jim Crowley and never looked in serious danger of being caught. Last year's winner and Nunthorpe heroine Marsha did her best to bridge the gap inside the last of five furlongs, but Battaash was away and gone, being comfortably clear at the line. Sir Mark Prescott's Marsha held on to the runner-up spot from the Clive Cox-trained Profitable in a British-dominated finish. 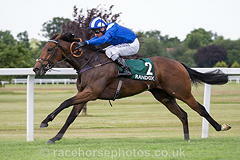 Hills said: "He was quite simply a different horse today than the one you saw at York. As soon as he arrived in the stables this morning, I knew that. "It's very important to win that Group One with him and he did it in great style. "I'm looking forward to having him around next year. He's finished for this season, but everything is open next year, including the Breeders' Cup." Marsha looks to have run her last race for Prescott and the Elite Racing Club. Prescott's assistant and business partner, William Butler, said: "She's run consistently well all year and we'll do well to get another one as good as her. "The next date in her diary is the December Sales and that's likely to be where she's heading."